I’m not vegan, but I started making vegan pesto because I can’t find cheese that isn’t packaged in plastic. I blogged about buying an unpackaged whole cheese wheel a couple of years ago, but it’s really expensive and you have to wrap the cheese in something when you get it home. You can shred all of the cheese and freeze it in glass jars, but that doesn’t take care of the fact that buying whole cheese wheels isn’t affordable for most people. I have a pesto recipe on this blog from a couple years ago that has cheese in it. But I don’t make that recipe anymore. I discovered something that makes pesto taste good without cheese – nutritional yeast. In some places you can buy nutritional yeast in bulk, but even if you have to buy it in a package you’ll cut down on waste because you only need a few tablespoons per batch of pesto. You’ll save money too. Another thing I want to mention is that I discovered a great trick for storing basil without using disposable stuff. My summer job is working in a professional kitchen, and we have to store vegetables and fruits in plastic bags with paper towels to absorb moisture. I tried storing the basil leaves for this pesto in a glass container with a cloth napkin and it worked. The basil leaves were still fresh and ready to use in pesto when I needed them. A word on the food processor: yes it’s plastic, but glass food processors don’t seem to exist. I would love to have one if they did. This food processor is very old and might break soon (it’s 14 years old) and I’m going to replace it when it breaks if a repair isn’t possible. There is so much that you can do with a food processor. I can make a bunch of things in it that I would have to buy in plastic tubs otherwise. So I think it’s a worthwhile thing to own. 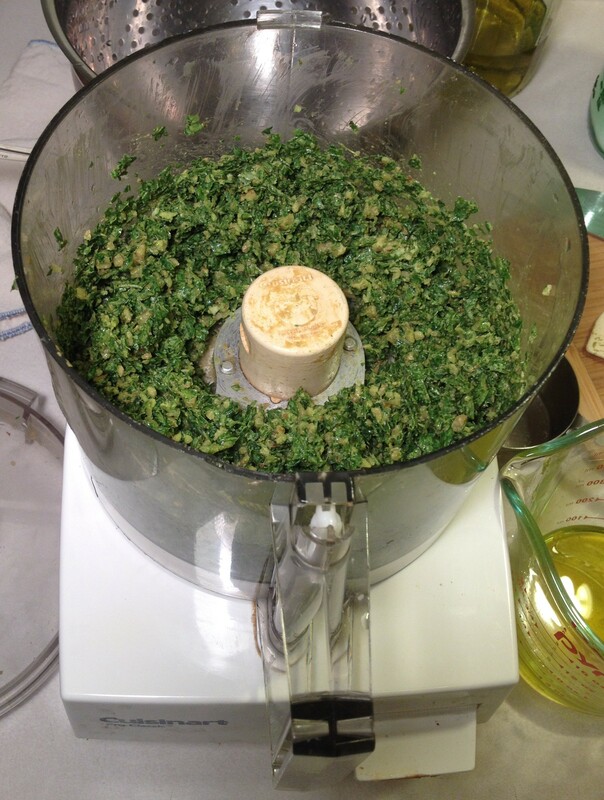 Put basil, walnuts, garlic, nutritional yeast and salt in the food processor. Pulse until well combined. With food processor running, slowly pour in olive oil. Process until smooth. Store in a glass container in the fridge. I used a small jar. I ate some with zucchini noodles for lunch. It was delicious. Basil – Pretty minimal, but the basil had a rubber band around the stems. Love your column! Genyana and I will try this! 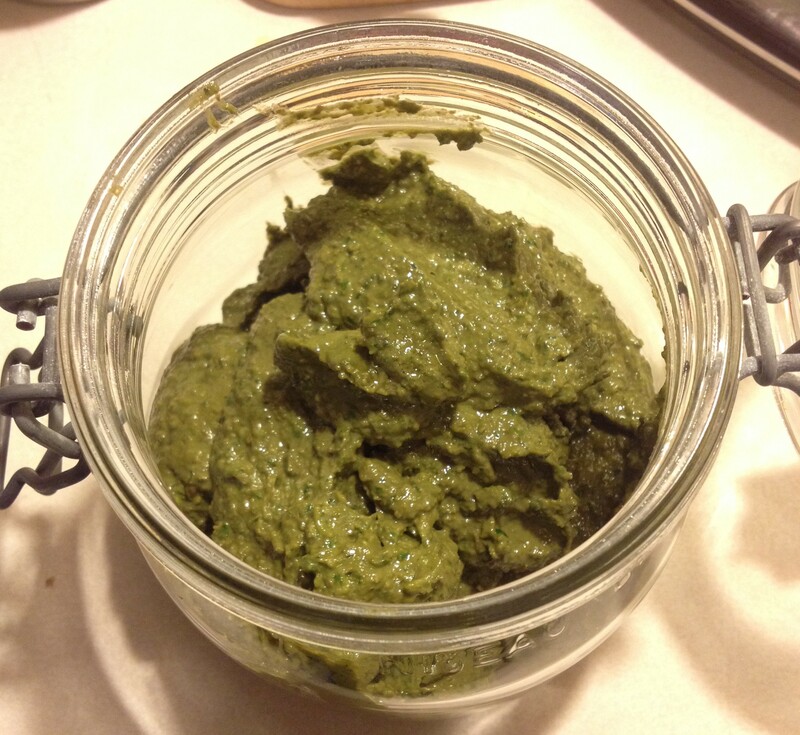 The best pesto she ever ate was a vegan one a friend made from cashew “cheese” awhile back. Thanks! I hope you like the pesto. I had cashew cheese in vegan ravioli one time. It was really good – I’ll have to write a post about it sometime. At least rubber bands are re-usable for quite a while, so not too bad. My housemates are always coming home with blue rubber bands on things from Whole Foods. (We’re not as good at not wasting as you, so although I usually bring my own containers, we get lots of compostable boxes, which at least do get composted.) I make one of them take the rubber bands back – I think he just puts them in the little dish at the cashier, without saying anything. So they get re-used, but I bet the store wouldn’t want to know they’ve been to our kitchen! I try to say “NO! quickly before they put a band or tape on my egg carton or whatever. Thanks. Cool blog. Your photos are really good. My daughter MKat started us on the zero-waste path in 2011 at age 16 and soon afterward launched her blog “The Plastic-Free Chef.” She says my constant complaining about the sea of plastic in grocery stores (and my ensuing lack of action for the most part) inspired her to figure out how to change our routine. 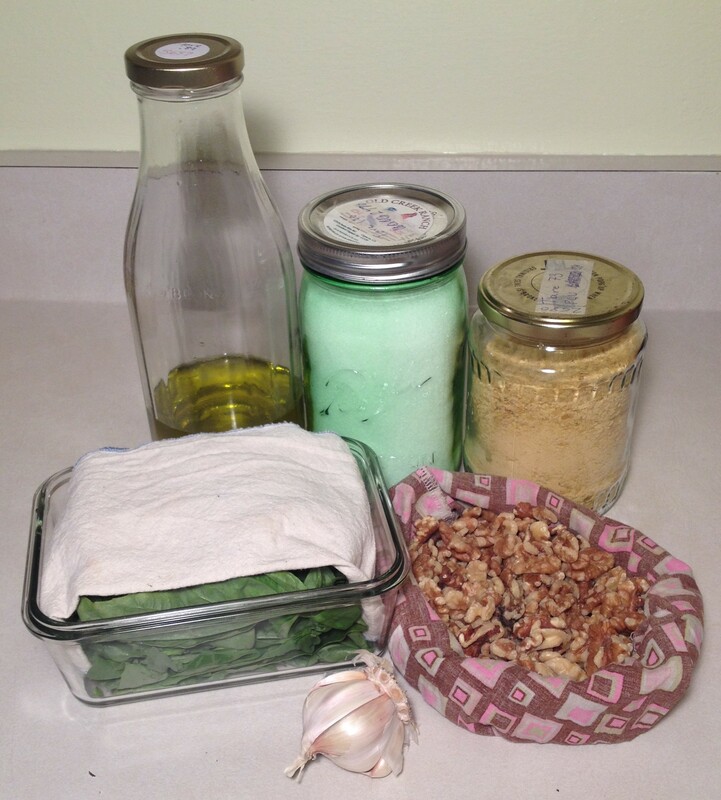 When she returned to the olde country (Canada) for university in 2013, she found the plastic-free routine difficult to keep up and stopped writing. I’m so happy MK has recently resumed writing her blog. Everything she makes tastes fantastic and this vegan pesto is no exception. This is such perfect timing as I’ve got some basil that was given to me that I need to use pronto! I was planning on making regular pesto with parmesan (I do still buy cheese in plastic, what’s a girl to do! ), but I can’t eat it right now as I’m on an elimination diet and completely off of dairy (at least for now). And I’ve got all of the ingredients for this right here at home! Woohoo! Thanks! Nice, hope you like it! I put the basil in the container and put the cloth on top of it. I didn’t dampen the cloth. Cool about the greens – what kind are you growing? I’m trying to grow kale and lettuce but the seedlings are still pretty tiny. I admire people who do their best to go for a zero waste lifestyle and reduce the our footprint! I like the idea of keeping basil leaves fresh and ready for the vegan pesto. Keep up the good work!